If you want to give your child the best start in life the importance of reading aloud to them from an early age cannot be stressed enough. Research shows clearly that preschoolers whose parents have read aloud to them frequently show better language growth, better awareness of phonics and better beginning reading skills. These advantages enable these children to become successful readers. Children who love reading have comparatively higher IQs. They are more creative and do better in school, being able to concentrate better in lessons due to superior listening and reading comprehension skills. They have a richer vocabulary and better language and communication skills. How can reading aloud to your child possibly have such a positive impact? Below I explain more about the importance of reading aloud to your child and how such an enjoyable and painless task can have so many benefits. Follow this link for some practical tips on reading to children. Reading is an accrued skill. The more your child reads, the better they get at it and so the more they enjoy it and the more they are likely to read. By reading aloud to your child you provide the incentive for your child to want to start reading on their own. They associate reading with a pleasurable experience - cuddles with Mummy or Daddy and the enjoyment of hearing an exciting story. They are therefore more likely to want to start to explore the world of reading on their own. There are only two ways for a child to learn new words. They can either hear new words or see them. If a child cannot read yet, the only way they can learn new words is to hear them. If they hear a new word often enough they will learn it. Later, when they come across that word while reading it will help them make sense of it, since that word is already familiar to them. By reading aloud often enough to your child you will expose them to more and more new words. When they are eventually ready to read they will draw on this repository of words to make sense of what they read. The richer the vocabulary your child has been exposed to, the better will be their listening and reading comprehension which will help them enormously throughout their school life. Even when your child has started to read, the importance of reading aloud to them does not diminish. 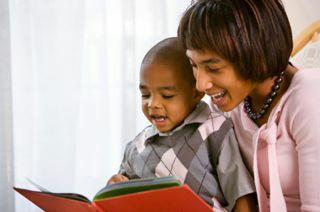 Children continue to benefit from listening to others read for a long time after they themselves have learned to read. Until the age of 13 or 14-years-old children listen on a higher level than they can read. So when you read aloud to children below this age you can read stories with more complex vocabulary and storylines than they would be able to read on their own. Reading aloud to your child builds their vocabulary more effectively than if you were just speaking to them. Most conversations between adults consist of around 10,000 words. There are, however, hundreds of thousands of other words in the English language which are not used very often in conversation. The strength of our vocabulary is determined by the number of these ‘rare’ words which we understand. Since rare words are not often used in speech, the best way to expose your child to these words is through reading to them. A children’s book contains more than three times the number of rare words than an adult would generally use talking to a three year old child. A key indicator of a child’s later success or failure at school is their vocabulary on entering school. A child with a rich vocabulary will understand more of what the teacher says than a child with a poor vocabulary, and so will learn more. Once the child starts reading, their reading comprehension will also be better because of their superior vocabulary - having heard a word before they are more likely to be able to read it. Once your child is reading, impress upon them the importance of reading as much as possible. The more children read, the better they read. So help your child become a good reader by motivating them to read, suggesting books for them to read and encouraging deeper reading, as well as continuing to read aloud to them. In order to read fluently and gain meaning from what we are reading we do not read every word. Instead we predict some of the words based on what we know would make sense in the context of what we are reading. To make accurate predictions we need to have both a rich vocabulary and some experience or knowledge of the subject. By reading aloud interesting and varied books to your child you are giving them more experiences with which to build up their background knowledge. Remember to add additional explanations about parts of the book they may not understand because they have not come across them before. In the future, when your child is reading on their own, they will draw on this bank of knowledge you helped them create in order to make sense of what they are reading and become a successful and fluent reader. Non-fiction picture books are ideal for introducing younger children to new subjects and broadening their pool of background knowledge. If you are interested in finding out more about the importance of reading aloud to your child, I can strongly recommend the following books. The Read-Aloud Handbook by Jim Trelease is a favourite of mine. Supported by interesting anecdotes and the latest research, it explains in a compelling way the importance of reading aloud to your child to set them on the road to becoming lifelong readers. Over 100 pages are dedicated to a ‘treasury’ of books which are ideal for reading aloud. I find this to be a really useful resource. Reading Magic by Mem Fox, the popular author of many children's books, explains why reading aloud to young children has such a big impact on their ability to read. Fox describes how reading aloud gives children an understanding of print and language and helps build their background knowledge, which all lead to better reading. The books also includes advice on when and where to read aloud, how to find good books and how to get the most value out of a read-aloud session. A great read! Raising Readers by Steven Bialostok discusses how children develop literacy, and how reading aloud to your child, providing experiences for your child, and talking with your child are the most important factors in helping your child learn to read. It includes lots of practical advice on how to support your child while they are learning to read, including a question and answer chapter which addresses common concerns of parents.